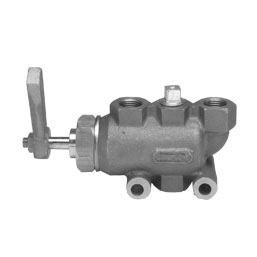 The Conflow Code 46 - Directional Valve diverts incoming fluid to a choice of two outlet feeds in hydraulic systems, enabling incoming fluid to be directed, where appropriate, with a single handle movement of the valve. Plastic valve seats enables tight shut off to be achieved to each outlet and, as there is no shut off during changeover, an intermediate position can be selected to feed all the outlets if required. Maximum working pressure 105 bar. 2 Position, 3 Port Directional Valve.